Home▶2018 Shortlists▶Attack of the Alien Dung! We have received 28 reviews of Attack of the Alien Dung! . You can add a review or scroll down to read reviews. To send in your review of Attack of the Alien Dung! , please fill in the info below and click the button labelled Send Review Now. Reviews will be checked by our team before they appear on the website. Your last name will not appear on the site, but we need to know who you are in case you win a prize! Welcome to the world of award winning author, story-teller & musician Gareth P. Jones: a world of Ninja Meerkats, Steampunk Pirates, dragon detectives, murderous twins, dark family secrets, bureaucratic ghosts, Victorian illusionists, dinosaur parties, time travel mysteries, funky ukuleles, sinister accordions, alien-fighting pets, death and ice cream. Before becoming a published author, Gareth worked in TV, on shows such as The Big Breakfast and Richard & Judy. He spent some time making television programmes about crime authors such as Ian Rankin, P D James, Ruth Rendell, Val McDermid and Colin Dexter. Pet Defenders are secret agents with a difference. It's up to Mitzy and Biskit to save the world from alien invasions - just so long as they can stop fighting like cat and dog for long enough to do it! Secret agent Biskit is not happy when he discovers his new partner Mitzy is a cat - everyone knows that cats and dogs don't mix. But saving the earth from alien invasions must come first and the planet is under attack! A cluster of cow pats has flown into town and they're whipping up a stink... It's time for Biskit and Mitzy to put aside their differences. Fact 1: The second and third books in the series are already out for you to read. They are called Beards from Outer Space and Escape from Planet Bogey. Check out the awesome Pet Defenders theme tune on his website. Fact 2: His parents are called Leslie and Lesley. Fact 3: He won the Blue Peter Book of the Year 2012 with his book The Considine Curse. 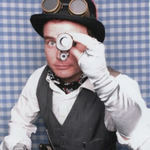 Fact 4: He has also written a Ninja series "Ninja Meerkats". I think that this book was good but it was not my style in books it is about a dog who is a secret agent and is trying to save the world. Lily-Rose gave Attack of the Alien Dung! 3 out of 5 and now plans to read Knighthood for Beginners by Elys Dolan. I liked it because it was very funny.My favourite character was Mitzy the cat . Savannah gave Attack of the Alien Dung! 5 out of 5 and now plans to read Knighthood for Beginners by Elys Dolan. Alfie gave Attack of the Alien Dung! 4 out of 5 and now plans to read Amelia Fang and the Barbaric Ball by Laura Ellen Anderson. I like about the book that its about animals and the best character in the book i think is Biskit. The book is about aliens attacking the agent pets. I think this is a good book for young children. They end up saving the world so i rate it a 3 out of 5. Harrison gave Attack of the Alien Dung! 3 out of 5 and now plans to read Amelia Fang and the Barbaric Ball by Laura Ellen Anderson. I loved this book I especially loved when the Dung splat all over the place. Heena gave Attack of the Alien Dung! 4 out of 5 and now plans to read Me and Mister P by Maria Farrer. This book is really funny and fictional. Annas gave Attack of the Alien Dung! 5 out of 5 and now plans to read Amelia Fang and the Barbaric Ball by Laura Ellen Anderson. I like this book because it has a dog and a cat and I like cats and dogs so I rate it at 4 out of 5.??? I like the dog better than the cat.what would you rate it for?12345! Rian gave Attack of the Alien Dung! 4 out of 5 and now plans to read Amelia Fang and the Barbaric Ball by Laura Ellen Anderson. i LIKE THIS BOOK IT IS NOT MY FAVORITE BOOK ALTHOUGH IT IS STILL FUNNY. MY FAVORITE CHARACTER IS Mitzy the cat.i would recommend this book to my cousin. Charlotte gave Attack of the Alien Dung! 3 out of 5 and now plans to read Amelia Fang and the Barbaric Ball by Laura Ellen Anderson. 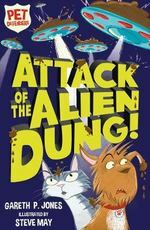 I serenely love the book Attack of the Alien Dung!!! It is full of excitement and mystery and my favourite character is Mitzy because I love kittens and she is soo brave. Also my favorite part is when Biskit and Mitzy become friends and work together as a team. And they're PET DEFENDERS! That's why I rated it 5 out of 5. Nada gave Attack of the Alien Dung! 5 out of 5 and now plans to read Amelia Fang and the Barbaric Ball by Laura Ellen Anderson. I like this book because it has dogs and cats and I like dogs and cats .I think it's funny because the dog and the cat get a Beatle and when they are dancing and celebrating the Beatle comes back.I like this book because it very funny and I like cats and dogs. This is the best book I have read this far. Thank you for letting me in the Leeds Book Award it's really fun. It is a really good book if you like funny and adventurous books. I like it because it was a very humorous book and a lot of unusual things happen like a weird beetle appears. And the illustrations are really good. The language is good for everyone over 7. Its definitely one of my favourite books yet! Seth gave Attack of the Alien Dung! 4 out of 5 and now plans to read Me and Mister P by Maria Farrer. It was a really good book in the middle of it.I really liked all of the dung.The characters were really funny especially the rabbit. Isabelle gave Attack of the Alien Dung! 4 out of 5 and now plans to read The Incredible Dadventure by Dave Lowe. It was a goodish book because I liked the meaning of the book but I would have liked there to be more aliens and I didn't really like Commander F because he was really mean and he was lazy and bossy. Ruairi gave Attack of the Alien Dung! 3 out of 5 and now plans to read The Incredible Dadventure by Dave Lowe. this is a very funny book. the author thakes you on an adventure my favorite part is where the beetle comes out of poo .I totally recomened this book for young readers who enjoy reading. GREAT BOOK!!! KEEP ON READING!!!!!!!!!!!!!!!!!!!!!!!!!!!!!!!!!!!!!!!!!!!!!!!!!!!!!!!!!!!!!!!!!!!!!!!!!!!!!!!!!!!!!!!!!!!!!!!!!!!!!!!!!!!!!!!!!!!!!!!!!!!!!!!!!!!!!!!!!!!!!!!!!!! Isaac gave Attack of the Alien Dung! 4 out of 5 and now plans to read Amelia Fang and the Barbaric Ball by Laura Ellen Anderson. I absolutely LOVED this book and it is 100 percent my favorite book I've read so far.I especially loved the huge battle between Biskit, Mitzy and the giant beetle.10 out of 10. Dylan gave Attack of the Alien Dung! 5 out of 5 and now plans to read Amelia Fang and the Barbaric Ball by Laura Ellen Anderson. I reeally liked it because of all the dung in it and because a Giant bunny falls on the dogs back. João gave Attack of the Alien Dung! 5 out of 5 and now plans to read Knighthood for Beginners by Elys Dolan. The book was quite funny and I liked it when the spaceships came up from the ground. My favourite character is Biskit because he is hilarious. Carlos gave Attack of the Alien Dung! 5 out of 5 and now plans to read The Incredible Dadventure by Dave Lowe. It was actually really good. The front cover looked a bit boring but when you got to the middle of the book there was a lot of action. The characters were quite funny - the big rabbit!. The cat and dog, didn't get along at first but that soon changed. Ben gave Attack of the Alien Dung! 5 out of 5 and now plans to read Amelia Fang and the Barbaric Ball by Laura Ellen Anderson. A mysterious book.I would only say have better vocabulary. Ana Maria gave Attack of the Alien Dung! 4 out of 5 and now plans to read Me and Mister P by Maria Farrer. I liked this book quite a lot however it would be better if it had better vocabulary to make it more interesting and more exiting. I could have never thought of this plot, though.It was very imaginative and I liked the way it had the Pet Defenders to protect the city from the ravenous space dung beetle. Holly gave Attack of the Alien Dung! 3 out of 5 and now plans to read Greta Zargo and the Death Robots from Outer Space by A F Harrold. I loved this adventurous story. It was amazing that he jumped of a cliff. This book was hilarious.As I am a cub I love adventure stories and this was the best I have read so far. yusuf gave Attack of the Alien Dung! 5 out of 5 and now plans to read Amelia Fang and the Barbaric Ball by Laura Ellen Anderson. I think this book had a interesting plot to it however i think an improvement would needed such as higher level vocabulary since the words are quite easy to read and understand. I thought the end was quite effective though because you don't want it to end. Maisy gave Attack of the Alien Dung! 3 out of 5 and now plans to read Amelia Fang and the Barbaric Ball by Laura Ellen Anderson. This book is amazing apart from the dung part! It is also funny and it teaches you a lot about how clever pets are and that sometimes they are needed to save your life. Patrick gave Attack of the Alien Dung! 4 out of 5 and now plans to read Amelia Fang and the Barbaric Ball by Laura Ellen Anderson. I thought the book was quite funny and it was even disgusting in some parts! My favourite character was Biscuit the dog because he is very funny. I would recommend this book to my class friends. Francesca gave Attack of the Alien Dung! 4 out of 5 and now plans to read Amelia Fang and the Barbaric Ball by Laura Ellen Anderson. I think the funniest part of the book was when Biskit met the cow and the cow named all the poo. When I saw the front cover I could kind of guess what the book was about. Dylan gave Attack of the Alien Dung! 4 out of 5 and now plans to read Amelia Fang and the Barbaric Ball by Laura Ellen Anderson. This book was interesting and very funny. I enjoyed it and loved the content of adventure. Since I am a Cub I truly know the meaning of challenge and for Mitsy and Biskit they had a huge challenge to complete. I would recommend this book for 5-10 year olds because of the humour and is extremely interesting I think Gareth P.Jones spent loads of time on this amazing book so he deserves to win this wonderful award. Madi gave Attack of the Alien Dung! 5 out of 5 and now plans to read Knighthood for Beginners by Elys Dolan. This exciting,fabulous and super book is extremely funny and exciting. My favourite character is most definitely Biscuit as he is very funny and is really silly from jumping off cliffs and just running into a bin. I love that it is animals rescuing people not the other way round and I love the forget me plop.This book is definitely worth 5 STARS!!!!! Benjamin gave Attack of the Alien Dung! 5 out of 5 and now plans to read Amelia Fang and the Barbaric Ball by Laura Ellen Anderson. This is a really fun book to read and it shows you that you really need to have friendship in your life.It didn't end the way that I predicted it would! It was a complete surprise. I would recommend this book to my Dad! Milan gave Attack of the Alien Dung! 5 out of 5 and now plans to read The Incredible Dadventure by Dave Lowe.